At SWAT Security we can supply, install and maintain all types of Fire Extinguishers either installed by us or supplied by other companies. The main types of extinguishers are Water, Foam, Co2, Powder and Wet Chemical. 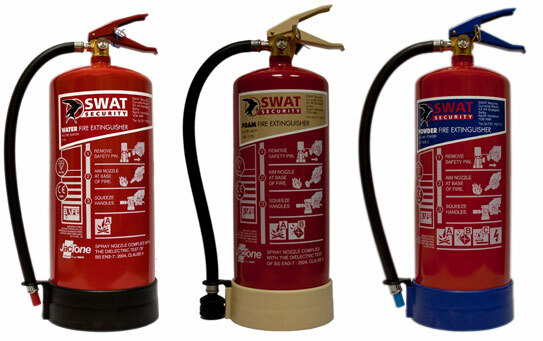 SWAT Security can advise you on the best extinguishers for your premises to meet all your specific needs and also provide the correct signage to identify each extinguisher. 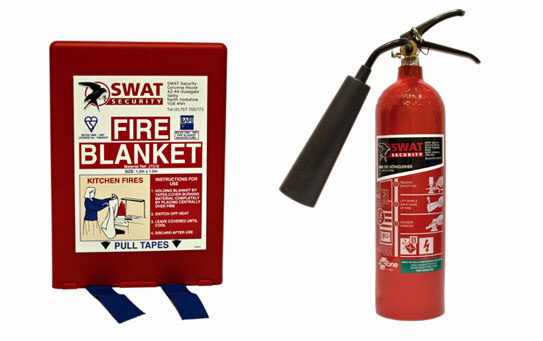 We can also provide Fire blankets and emergency/Fire action signage. All of our fire extinguishers we install are kitemark certified to BS EN3 and CE Marked. WATER - Water extinguishers are for use on class A Fires (Solid materials such as Wood, Paper, Textiles etc). Solvents etc) and also class C Fires ( gases such as propane, butane, natural gases etc). They can also be used on fires involving electrical equipment. computers etc). Class B Fires (Flammable liquids such as petrol, paints, solvents etc). such as Wood, Paper, Textiles etc). Thet are the perfect extinguisher for use in catering establishments and industrial kitchens. FIRE BLANKETS - The essential performance requirements of a fire blanket is to extinguish a cooking oil fire (as detailed in B5 EN 1869:1997). Therefore the blanket must be flexible with good draping qualities to eliminate oxygen from the burning oil – allow the oil to cool gradually to below its self-ignition temperature ant re-ignite when the blanket is removed after 17 minutes. All the fire blanket s that we supply and fit meet these requirements and are available in a variety of sizes to suite the individual requirements needed.